All dogs must remain on a six foot leash. Pick up and dispose of your dog’s waste (WoofWaste stations are provided at each dog friendly park). Those who do not pick up after their dogs risk being cited. Lithia Park is excluded as a dog friendly area; however, you can walk your dog on leash around the outer edges of Lithia and on the "old Pioneer Street trail," a walking trail that leads from the Parks office down to the topside of OSF on Pioneer. 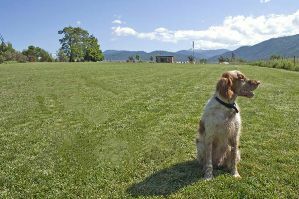 View our 'Suggested Dog Walk Near Downtown Ashland' map (PDF format). View the Dog Friendly Parks Map (PDF format).